After the Irish bands and bagpipes finished up their Friday night concerts at Salifest, a younger band with a much edgier look and sound took the stage on the Custom House Pier. SayWHAT? is a rock band from Chester, CT. I saw these guys setting up after the Clan O'Cleary concert and was thinking of calling it a night due to the intermittent rain that was giving no sign of clearing up. I wandered up to the train station wondering what was happening on the other stage. What was happening? Nothing. I mean, there was a bevy of young Ford reps showing off the new line of Focus, but there were no bands on stage. It seemed most people were in hiding. So, I took a few Ford trinkets (free backpack for the kids!) and headed back down Bank Street past all the dark vendor tents, deciding to call it a night before it really started pouring. By the time I got back to the train tracks near the waterfront, however, I could hear SayWHAT? really rocking the end of the pier. So, instead of heading back to my car to get out of the rain I found myself drawn back out to hear the last 20 minutes of the show. In the end I really didn't regret the extra walk or the extra rain because it turned out to be one heck of a good show! So, what to say about the band... The first thing you notice about SayWHAT? 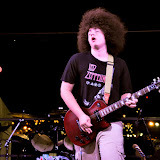 has to be the huge Afro that their guitar player, Ryan Newman, lugs around atop his sizable frame. Lead vocalist, Grace Carver, more than holds her own on some power rock anthems. The rest of the band is right there, as well, pumping out a serious wall of sound. Then Ryan channels the power of the 'fro' or Jimi or something because he lays down a blistering guitar solo that makes your ears start to bleed just a little and you start to wonder if these guys can possibly be as young as they look! Catch one of their shows if you get a chance! And, check out the pics of the band, below. SayWHAT? did not go unnoticed by anyone in the vicinity of the waterfront. Even the deaf *felt* their music! Categories: "Concert", "Connecticut", "Sailfest", "SayWHAT?"